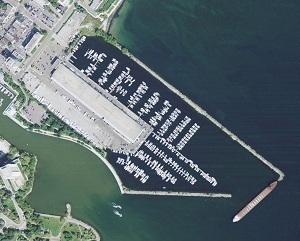 PORT CREDIT MARINA LANDS - OPA: Official Plan Amendment for the Port Credit Marina Lands (owned by Canada Lands Co. at One Port Street) is at the City's Planning & Development Committee (PDC) on Monday, June 12, 2017 @ 7:00 pm at Mississauga City Hall in the Council Chamber. Watch the live stream VIDEO. ► View the PDC Agenda (item 4.4) with a Report on Public Comments and text of the Revised OPA (on pp58-115 of the PDF), further to the previous PDC meeting (Sept. 6, 2016). ► TOPCA will be making a DEPUTATION at PDC, based on the outcomes of the TOPCA Waterfront Town Hall meeting (May 23, 2017), and it will be posted here afterwards. 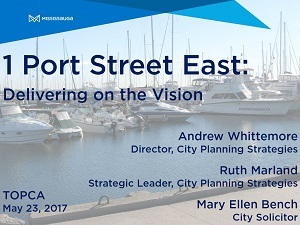 NOTE: The Marina Action Plan is a separate (but integral) process which will be brought to Planning & Development Committee (PDC) in Fall 2017. ► Andrew Whittemore, Director of Policy Planning for the City of Mississauga, together with Ruth Marland, Strategic Leader for Inspiration Port Credit, and Mary Ellen Bench, City Solicitor, made a PRESENTATION (14p PDF) regarding development of the unique aspects of the Marina Lands OPA to govern complex implementation over an extended time, and address other TOPCA concerns per the TOPCA Commentary (May 5, 2017) including the Marina Action Plan expected in Fall 2017. NOTE: TOPCA reps appreciated meeting with this staff team (May 17, 2017) to thoroughly review TOPCA's concerns regarding the OPA process / content, and the City's proposed solutions (presented at the Town Hall). ► James Cox, Director of Real Estate, Canada Lands Company, made a PRESENTATION and ANNOUNCEMENT at the Town Hall (May 23, 2017) concerning conveyance of 2+ acres of land plus the entire 50+ acre waterlot to the City of Mississauga "which would assist in ensuring the long-term protection and reinvestment in the marina". Below is an excerpt slide. ► Mississauga South MPP the Hon. Charles Sousa made a STATEMENT (read) at the Town Hall (May 23, 2017). ► Mississauga-Lakeshore MP Sven Spengemann made a STATEMENT (via Video) at the Town Hall (May 23, 2017). 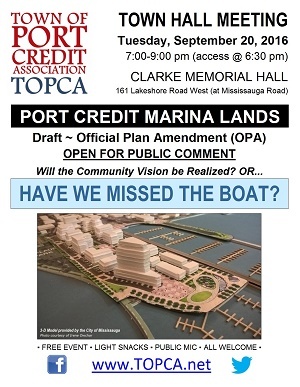 TOPCA COMMENTARY: May 5, 2017 - The TOPCA Executive submitted a written Commentary to the City of Mississauga concerning Public Process for the Port Credit Marina Lands at One Port Street since the TOPCA Town Hall Meeting 'Have We Missed the Boat?' (see below). The greatest concern is the status of the promised Marina Action Plan to transition the Marina to a new eastern breakwater. WE EXPECT THE CONCERNS TO BE ADDRESSED AT THE TOWN HALL. ► View the TOPCA Commentary (May 5, 2017) (5p PDF). 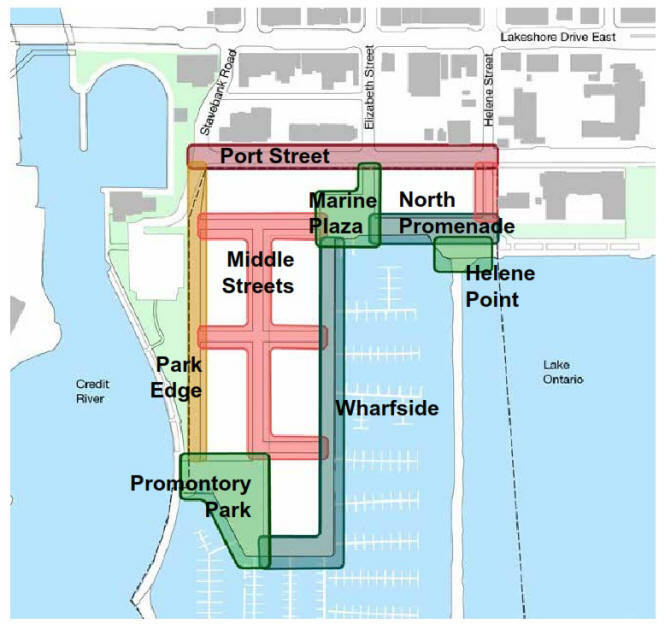 We're holding a local citizen-led forum for our members and other stakeholders in the Port Credit community, to discuss implications of the Official Plan Amendment for 1 Port Street (see below), and the forthcoming development process at the Marina Lands. We are delighted that Ward 1 Councillor Jim Tovey and MPP Hon. Charles Sousa are attending in addition to Inspiration Port Credit staff from the City of Mississauga, and representatives from Canada Lands Company. The public comments generated will be added to the Information Report which staff will present to PDC prior to any Council approval of the OPA (no sooner than November). Note there will be no release of the land for development without an approved OPA. Any other concerns re Port Credit developments can of course be discussed as well, as they are all part of the same issue of how Port Credit evolves as a whole (oh, and how we live through the construction!) It will be	great to get together! 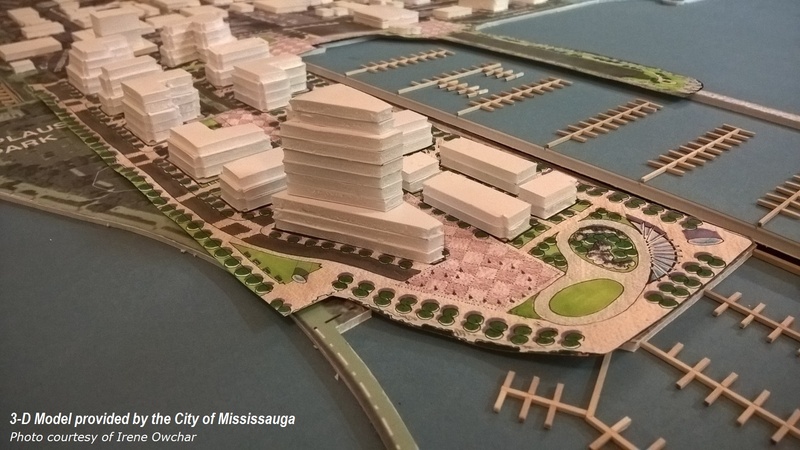 The City's public Planning and Development Committee (PDC) meeting concerning the DRAFT Official Plan Amendment in reflection of the Master Plan for the Port Credit Marina Lands took place on September 6, 2016 in the Council Chamber at City Hall. 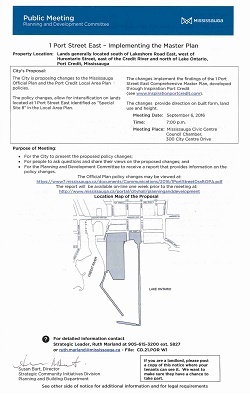 ► Click here for 2-page MEETING NOTICE sent to Port Credit residents. TOPCA reps made a DEPUTATION (Sept. 6, 2016) at this meeting, and encourage any members who wish to voice their comments to send their written comments as instructed in the Notice. TOPCA is also holding a Town Hall Meeting (see above). 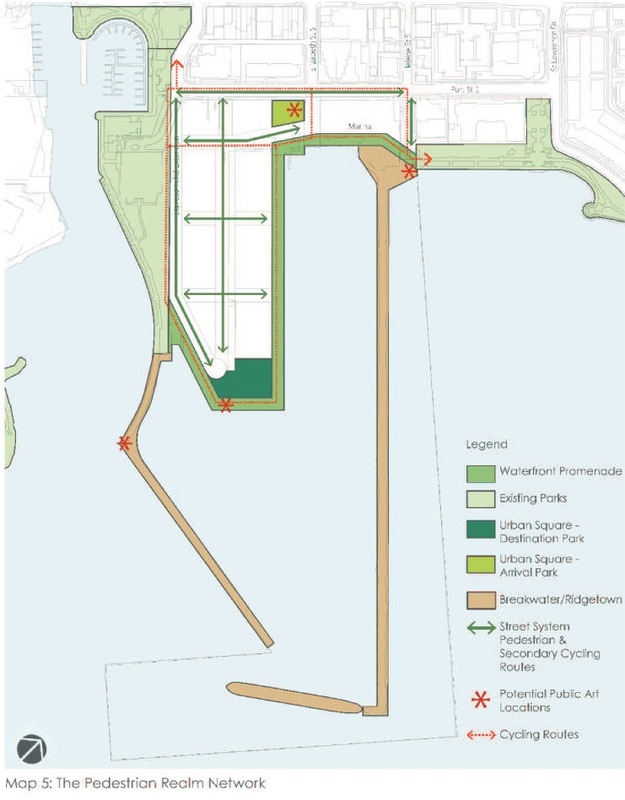 The City's public Planning and Development Committee meeting concerning the City's Draft Master Plan for the MARINA LANDS took place on May 30, 2016. ► TOPCA made a DEPUTATION (May 30, 2016) (6p PDF). 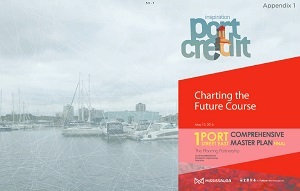 ► View the City's Master Plan on the Inspiration Port Credit website	(Image of the City's 3-D model below). 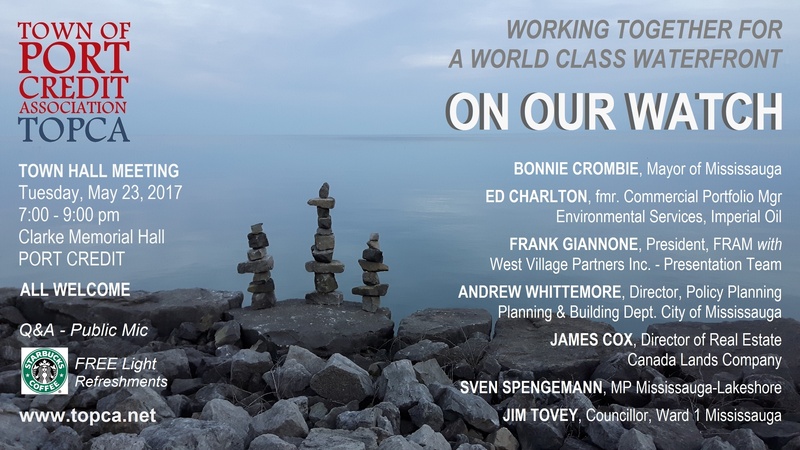 The TOPCA Executive, in conjunction with other Residents Associations in Lakeview, Mineola (Credit Reserve) and Cranberry Cove, along with the Port Credit Village Project, conducted a Round Table meeting on May 26, 2016, with the parties concerned i.e. the City project leaders and Canada Lands Company (CLC), to be sure we fully understand what the parties’ next steps are to ensure a full-service Marina. Still unknown is who will pay for its development. In addition, we sought clarification as to public realm provision (we don’t think it is enough), proposed heights and density, and mixed-use site configuration. There are in fact two (2) master plans, and we want to ensure the City’s is robust in its Vision and detail based on the extensive citizen input, before CLC (i.e. its development partner) begins submitting applications. 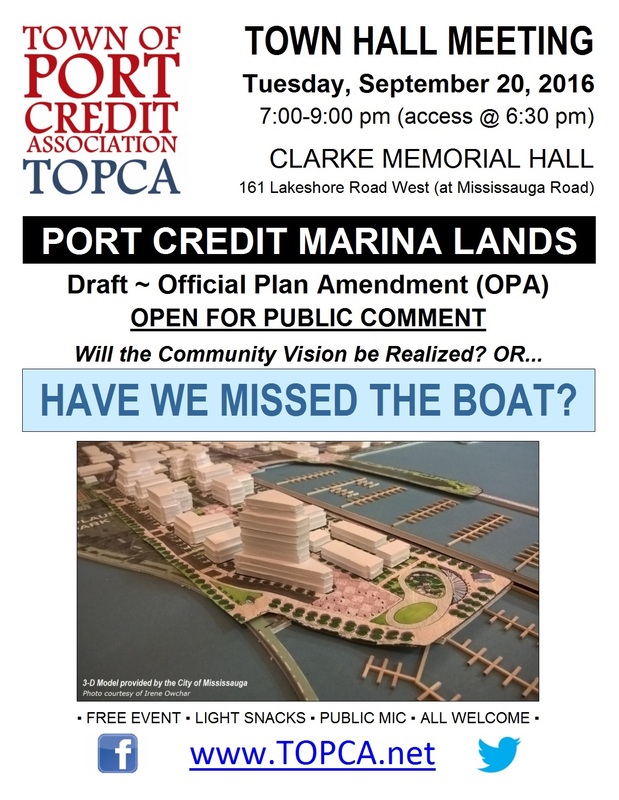 TOPCA reps are attending: On November 26, 2013, CLC convened a meeting of the Community Advisory Panel regarding wide-spread concerns expressed in the Port Credit community about CLC's Master Plan for the federal harbour lands. At TOPCA's Town Hall meeting on November 25, 2013 at Clarke Hall, MP Stella Ambler issued a statement that she is "opposed to the [CLC] Plan" and has informed the Prime Minister that she will be working with the community to get a design that works for the community. ► Click to view the Letter from MP Stella Ambler (hard copy: Nov 26, 2014). PUBLIC PROCESS: Canada Lands Company (CLC) is developing a master plan for the 1 Port Street site (Google map) through consultation with the community. The property includes an approximately 51 acre (20.6 hectare) waterlot (including the sunken Ridgetown) and 17 acres (6.8 hectares) of tableland on Lake Ontario at the mouth of the Credit River. ► Click logo image for CLC's One Port Street WEBSITE for project description. 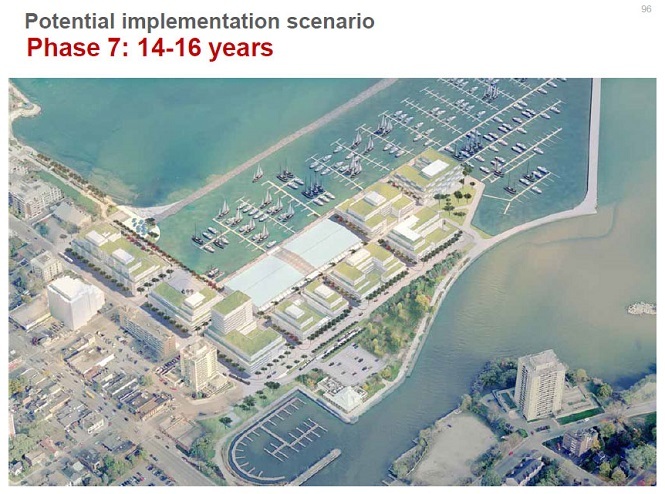 UrbanToronto article (July 19, 2013): Mississauga Considers Major Redevelopment at Port Credit Harbour. CLC MASTER PLAN SUBMITTED TO THE CITY: April 2013. 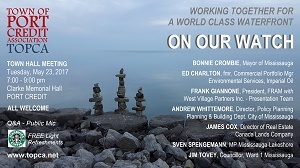 TOPCA has convened a Roundtable focus group (first meeting: June 23, 2013) of TOPCA members and citizen colleagues to draft our formal response to the City (Inspiration Port Credit), which will be circulated to all TOPCA members for final comments. Our preliminary concerns are outlined below. ► Click cover image to access the 90 page report. 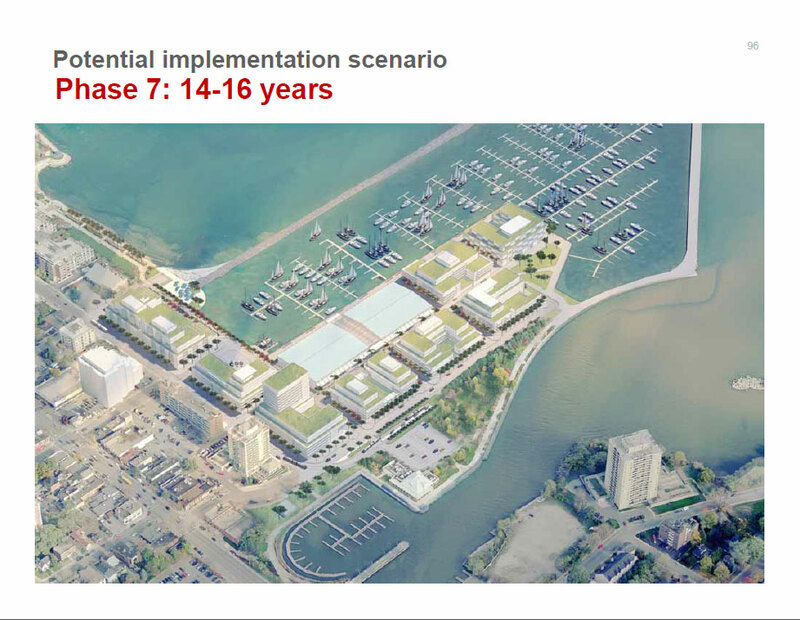 CONCEPT MASTER PLAN PRESENTED: On March 7, 2013, the consultants for Canada Lands Company presented their concept for phased development of the Harbour Marina Lands, culminating in the demonstration scenario shown here (slide #96 of the 97p PDF of the presentation) which is now posted. Click image below for enlargement. 1. OMB risk - Will CLC stick to their commitment at TOPCA’s March 2011 public meeting (Ramping up the Vision) that CLC may not be the builder, but will control the development until construction is complete to ensure that builders can’t undermine the master plan and appeal to the OMB for changes? At the March 7, 2013 meeting, we heard for the first time that CLC would NOT be involved once builders purchased pieces of the property, beyond having provided a conceptual master plan. What is to stop builders from seeking to deviate from the plan? Why then have a master plan? 2. Land valuation - Since it is currently public land, its value has yet to be set based on allowable land uses and intensity. The decisions made here will also have an impact on adjacent properties and the Imperial Oil lands. We need to know the estimated land value based on the new Port Credit District Local Area Plan and how that compares to the estimated land value based on the consultant’s proposal which appears to triple or quadruple the allowed GFA from 2-3 storeys to: 4-6 storeys and 8 & 14+ storey towers. Building costs may be one influence CLC can’t control, but we need to know how much of the proposal’s viability is based on inflated land and water lot costs. 3. Residential creep - This was very noticeable at the 3rd meeting proposal (March 7, 2013) after it was revealed that 1,000 to 1,500 residential units are now being baked into the financials. Considerable concern has been voiced consistently by citizens from the first meeting about minimizing residential land uses. The plan we saw could conceivably end up mostly residential + a bit of ground floor retail. If this is to be a truly mixed development, let’s set mandatory minimum and maximum limits on residential, commercial and industrial/artisan uses even if it takes time for the total development to be realized. 4. Public realm – Many felt that not enough public realm has been preserved in the scenario presented on March 7th to meet the needs for green open space and appropriate routes for pedestrians, cyclists and motorized vehicles. In fact what is proposed for parkland/open space is below standard, and 'payment in lieu' is felt to be unacceptable. There is no way to 'compensate' for the deficit in open space, which precludes full realization of the mixed-use vision for the site. It is disappointing that the nether-most tip of the property is not left open as public space, but is half-consumed with a condo. 5. Marina use – The possibility of the Marina use being moved to the east breakwater to address concerns about safety, access, space, convenience and boat storage was not adequately evaluated and presented and requires further engineering and shoreline analysis along with additional public input, now that it has been raised as an option. Storms from the east are not inconsequential and the 'variant' of using the eastern breakwater for motor vehicles may prove unworkable. Much work still needs to be done on the boat storage issue -- alternate approaches (e.g. at the Imperial Oil brownfield lands) need to be fully assessed; mere 'assumptions' for such a significant decision need to be verified before the harbour site design proceeds without it. It is felt that the Marina use is being 'squeezed out' and will be lost through attrition. Surely this use should be privileged on the site to ensure this unique deep water port and full-service marina continue to keep the port functional, authentic and vibrant. 6. Proposed Hurontario LRT – There is a proposal by CLC to further re-route the potential LRT down Stavebank Road to the Lake, given that the City's design process has included the possibility of the LRT extending along Port Street. This extension is seen by CLC as supportive of intensification of the One Port Street site and its built form aspirations. There needs to be far more evaluation of the entire LRT business case, and the viability of a Port Street extension, let alone a Stavebank Road piece. The Master Plan should not be based on speculative transit links. In December 2011, representatives of 3 local residents’ associations (including TOPCA) and other groups in Port Credit met with facilitators from the Canadian Urban Institute (CUI) retained by Canada Lands Company (CLC). The purpose of the series of small meetings was to solicit stakeholders' thoughts and opinions regarding a process for the development of a master plan for CLC's site at 1 Port Street East (Google map). ► Click to view the C.U.I. (consultant's) REPORT released January 20, 2012 (3p PDF). Summarizes all the stakeholder input received in December 2011. ► Click AERIAL PHOTO for enlargement and for context. 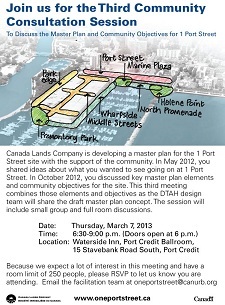 PORT CREDIT HARBOUR MARINA LANDS - PUBLIC MEETING #3: March 7, 2013 at the WATERSIDE INN. At this meeting, the draft Master Plan concept will be presented followed by interactive round table discussions. 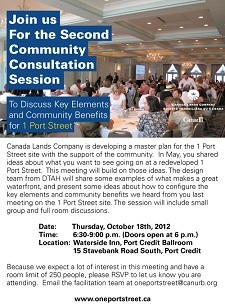 PORT CREDIT HARBOUR MARINA LANDS - PUBLIC MEETING #2: October 18, 2012. 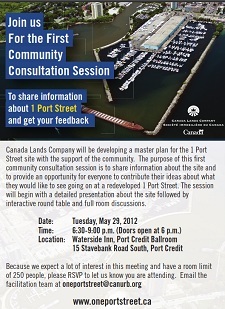 The purpose of this second community consultation session is to build on ideas contributed (click for REPORT) at the first public meeting on May 29, 2012 (click for PRESENTATIONS) about redeveloping the 1 Port Street site. The session will begin with presentations followed by interactive round table and full room discussions. 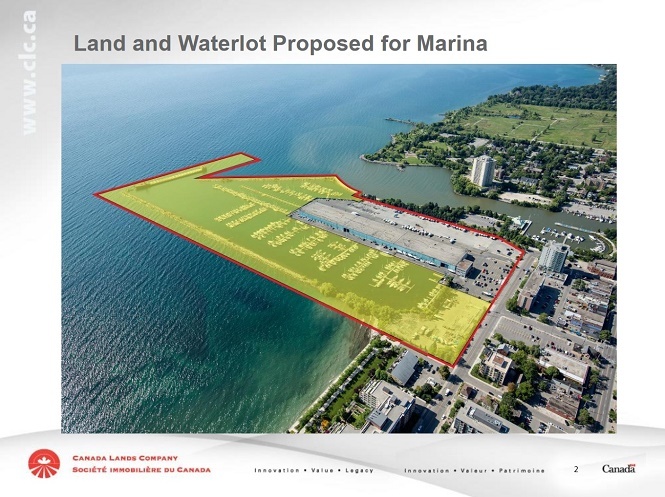 PORT CREDIT HARBOUR MARINA LANDS - PUBLIC MEETING #1: CLC plans to proceed with three (3) public meetings regarding the future use of this property, starting on May 29, 2012 at the WATERSIDE INN. 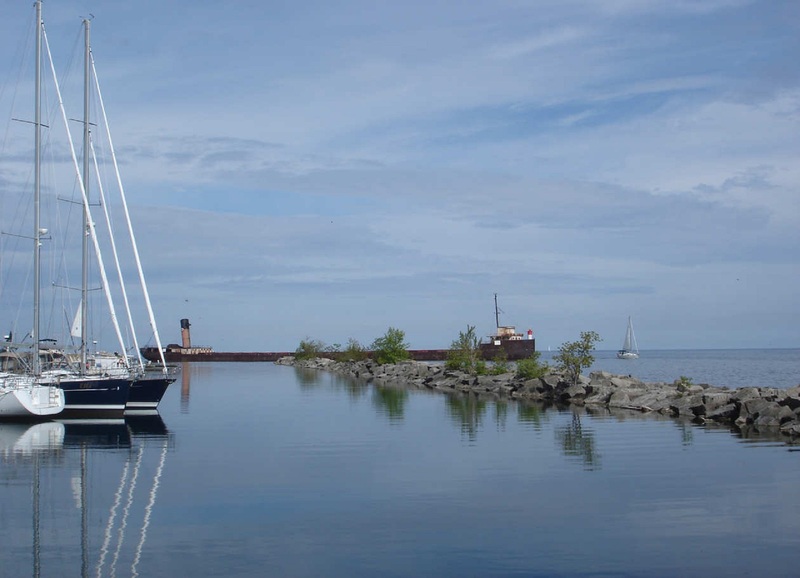 RIDGETOWN: The Port Credit Directions Report (PDF pp8,73) referenced the importance of the Ridgetown to the harbour and community as a cultural heritage feature. 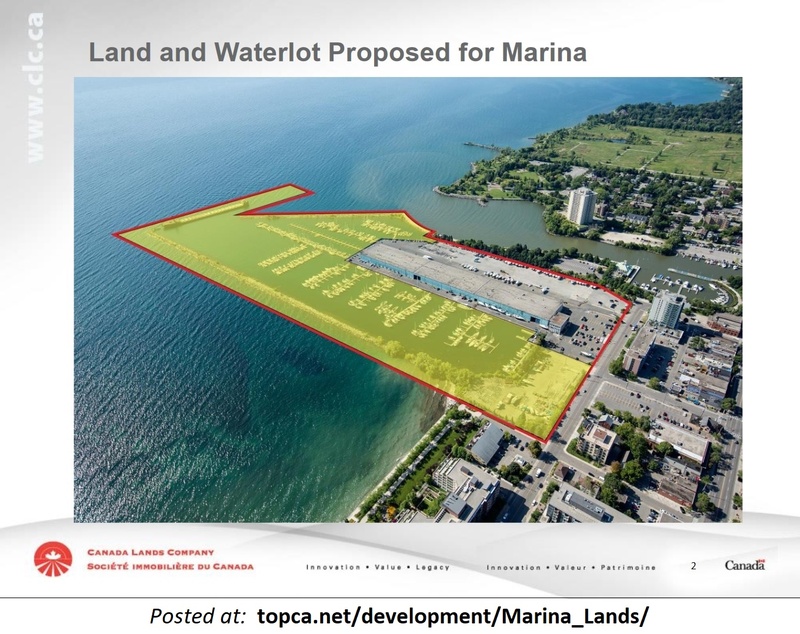 The community will be able to address this issue once the tertiary study for the Port Credit Harbour Marina lands begins following the Inspiration Lakeview study. 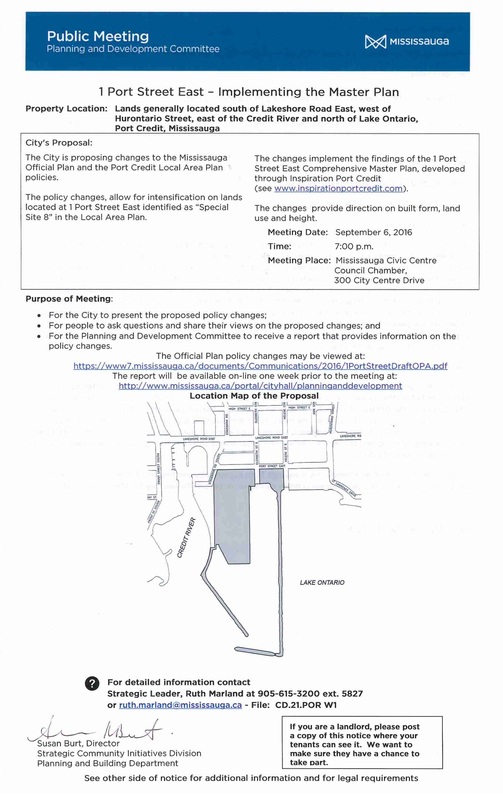 ► Mississauga News (August 9, 2010): City initiates Lakeview study. ► Wikipedia: "The RIDGETOWN (launched June 24, 1905 as WILLIAM E. COREY, a Lake Bulk freighter) has been a signature structure of Port Credit since June 21, 1974, when she was loaded with stone and, with her cabins and stack still in place, sunk as a breakwater for the Port Credit Harbour. She remains on guard there today." ► TOPCA's Facebook PHOTO ALBUM tour of the Marina Lands. 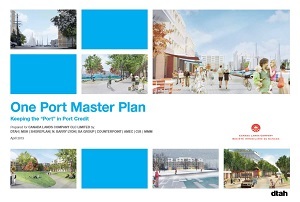 ► TOPCA held a public meeting on March 22, 2011: 'Ramping-up the Port Credit Vision' featuring a presentation by CLC (18p PDF).